Hastings bowl - 3" (76 mm) high, 4¼" (107 mm) diameter. Hastings Pottery was started in 1956 by Bernard Cotes and Dennis Lucas. Cotes, who had previously worked at Orchard Pottery in Addiscombe near Croydon in Surrey, left in 1959 and some time later started Battle Pottery, not far from Hastings. Lucas continued to run Hastings Pottery until 1995 when it closed. The company made earthenware and stoneware pieces, thrown and hand-built. 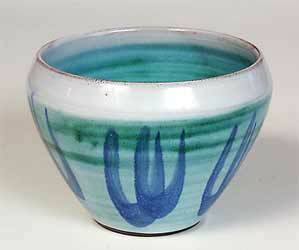 Dennis Lucas continues to make decorative pots from his new home in Devon.